When Supertyphoon Yolanda (Haiyan) wiped out entire cities, took away thousands of lives, and left families without homes to go back to – the extent of the devastation caught many by surprise. But it was also picture that we were already familiar with. The tragedy of Yolanda is entirely reminiscent of the heartbreak we felt as a nation two Decembers ago. Only, that storm was called Sendong (Washi) and instead of the Visayas, it battered Northern Mindanao and a portion of Negros. Two Decembers ago, lives were also lost. Families were also left without homes. And for a while there, we asked ourselves the same questions in hearts of the survivors – Is it really possible to rebuild from what is lost? Can we really find the courage to begin again? For both Sendong and Yolanda, the devastation was so massive, it could only be confronted with the courage to give like we’ve never given before. Among the remarkable heroes who responded is San Miguel Corporation (SMC). Being one of the largest conglomerates in the country, SMC, through its Foundation, was able to influence its prominent brands, including San Miguel Global Power Holdings, San Miguel Brewery Inc., Petron Corp., San Miguel Purefoods and San Miguel Yamamura Packaging Corp. to respond to the rebuilding efforts following Sendong. The heroic response of SMC gave rise to a total of 5,000 homes for the Sendong survivors, also taking corporate social responsibility to the next level. 2,500 of these homes are now in GK communities that have been (or are being) built in Iligan City (1,348), Cagayan de Oro City (500), Bukidnon (20), and various towns in Negros Oriental (632). With equal fervor, the local government of the different provinces also responded to the call by providing secure land and site development where the communities can be built, along with technical teams to help Gawad Kalinga (GK) in the planning stages. The extraordinary people comprising the local GK teams also mobilized their groups to implement the GK programs, most importantly, community organizing, in order to make the families feel that we are with them through this most difficult time. “GO, Mabinay, GO!” was the cry of the Mabinayanons during the turnover of Tie-One GK Village in Mabinay, Negros Oriental last October 26, 2013. Thanks to SMC’s generosity and courage to care, this new community of 30 families who survived Sendong can now look forward to a brighter tomorrow. 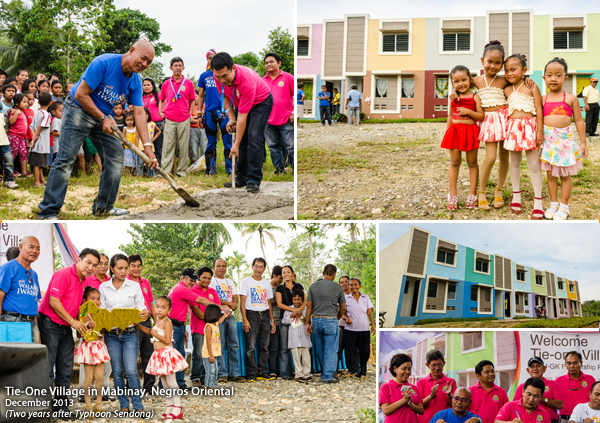 Hope rises during the turnover of homes in the Tie-One Village in Mabinay, Negros Oriental last October 26. It also marked the MOA signing and groundbreaking for the next 30 homes. It was truly a refreshing sight to witness their sheer joy when they were awarded their new homes. Their hardships were replaced with the promise of starting anew, and you could really see hope rise. This community is also a testament to the bayanihan spirit of Filipinos. Mabinay was one of the 37 sites in last year’s Bayani Challenge. From a total of 100,000 volunteers, 8,000 volunteers from all over the Philippines flocked to the site and neighboring areas in Negros Oriental to help and have fun at the same time. >> For this year’s Bayani Challenge, we targeting to raise 1 million volunteers to rebuild Visayas. Click HERE to learn more. 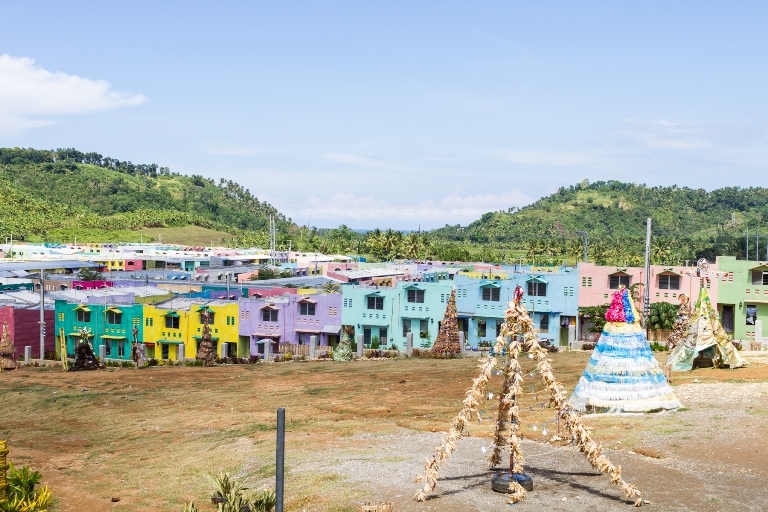 The hope that is now rising in Mabinay is something that we have seen and continue to see in the Bayanihan sa Iligan Village, where 1,348 homes for Sendong survivors now stand. 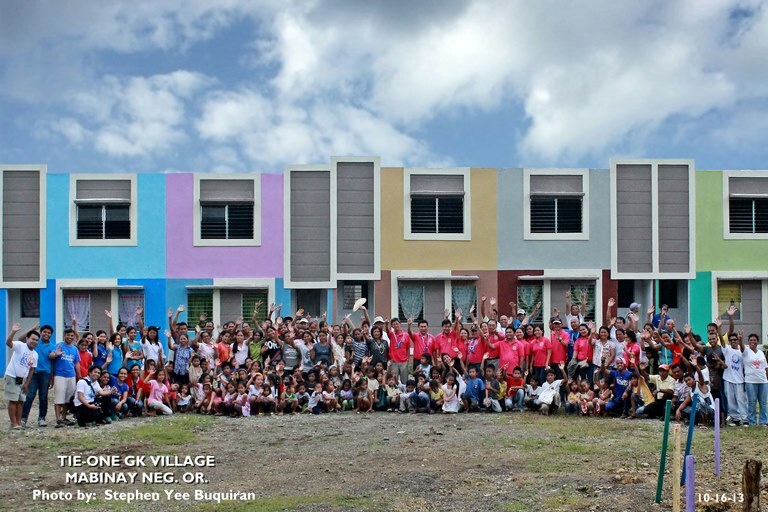 Last December 20, 2013, the last batch of homes was turned over to the community, staying true to the promise of leaving no one behind. 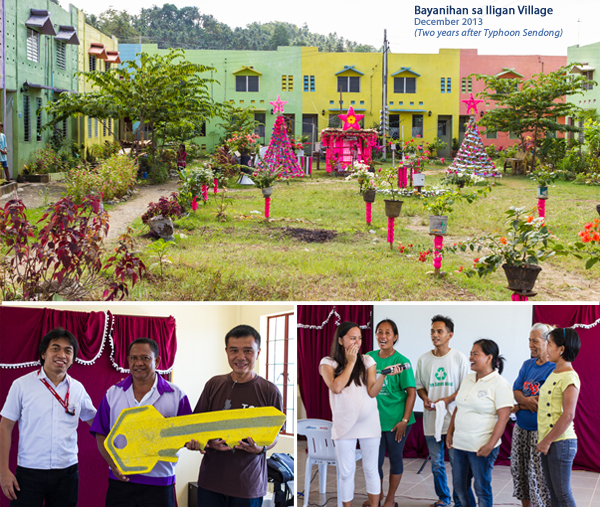 It was indeed a Merry Christmas for the last batch of families in the Bayanihan sa Iligan Village as they received keys to their new homes. David is just one of the many Sendong survivors who have found hope in the midst of disaster. Today, they are the ones building hope for others. When Typhoon Pablo (Bopha) struck Cateel and Compostela Valley last December 2012, just a year after Sendong, a contingent of residents from the Bayanihan sa Iligan Village were among the heroic volunteers who went and gave relief to the affected areas. They, more than anyone, know what it’s like to rebuild from the ruins of disaster. Through Sendong, Pablo, and now Yolanda, Filipinos have shown such great resiliency, and we have become dangerously accustomed to it. When these disasters strike, we are ready to help with giving relief, and we even go beyond that to build hope that lasts. But let us not wait for the next disaster to realize that we can do something to avoid such devastation. All of us can contribute to take action for what can be prevented and move families from danger zones to safer ground – even before disasters strike. Two months after Yolanda (Haiyan), Team GK is now hard at work with the rebuilding phase. New homes are now being built, and programs (roof and fishing boat repairs) are now being run. Just as SMC and GK did for the survivors of Sendong, together, let us strive to look for long-term solutions for the survivors of Yolanda and not just settle for short-term remedies. But all of this is easier said than done. For the families who survived Yolanda, the tragedy is still so fresh. The grief and heartbreak is still there. For some, it will never really go away. But as we say, “the impossibility of the problem can only be met with the infinity of our love.” The families who survived Sendong now carry hope with them, and more importantly they are now the ones helping build hope for others. They are the ones who can answer, with conviction, the questions that are in our hearts. Yes, it is possible to rebuild from what is lost. Yes, it is possible to find the courage to begin again. Together, let us help them find that courage. Super Typhoon Haiyan (Yolanda) made landfall in the Philippines last Nov 8 and caused widespread grief and devastation. But the scale of the problem is nothing compared to the overflow of generosity and heroism, as friends and partners from around the world rally together in bayanihan to help the Filipinos rise again. You too can be part of Operation Walang Iwanan and help GK in relief, rehabilitation and reconstruction. CLICK HERE find out how.